Vic McQueen (Ashleigh Cummings) is a teenager on the outs with her parents (Ebon Moss-Bachrach and Virginia Kull) who develops supernatural powers that connect her to Manx. The cast of NOS4A2 was at WonderCon for a panel and premiere of the pilot epiosde. Afterwards Quinto, Cummings, Moss-Bachrach, Ólafur Darri Ólafsson and Jahkara Smith spoke with reporters in the press room. 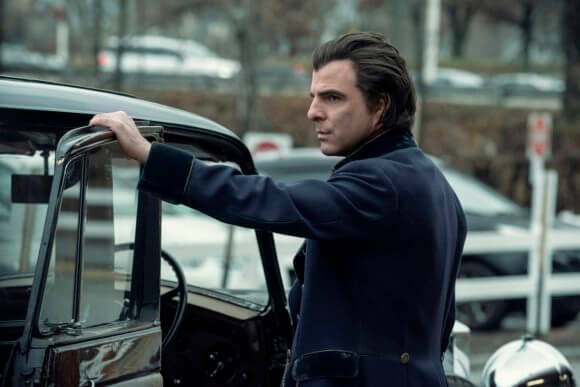 NOS4A2 premieres June 2, 2019 on AMC. How did it feel to see the audience react to the trailer? What is your take on Charlie’s relationship with his car, The Wraith? What brought you to the project? How do you see Vic rising to the occasion? Ashleigh Cummings: “It’s interesting, kind of in answer to that question as well, what I really loved and appreciated about both the book and the script and what drew me to Vic was the fact that in this day and age, we’ve seen this rise of female heroines, often superheroes that are women. And it’s been super empowering to see these on our screens. What I have noticed is there is a lot of emphasis placed on external strength or an unwavering emotional fortitude. How did you get the accent? How did you approach the theme of children being failed by their parents? Zachary Quinto: “I think the more you learn about Manx, the more you realize how failed he was as a child and how much trauma he experienced at a very young age and how the lack of resolution of that trauma and the inability to examine it is actually what evolves him into this kind of monster. So building on what Ebon was saying, the idea of where is the love and how do you love a character that’s so evil and doing such reprehensible things? For me, it’s been about going back to the source of that trauma. And I think what we were trying to build is the idea that Manx actually really thinks he’s doing good on some level, saving these kids from their neglectful and selfish, thoughtless parents. Jahkara Smith: “I think the crazy thing is, like you said, all the characters in a way have been these failed children. So you sort of see the results. The cool thing about the TV show is that the characters and their backstories are so expanded and you see so much more of what it’s like to be them. You sort of see the aftermath of what happens when kids are neglected and they’re not taken care of properly and you’re faced with the fragility of kids as a whole because on one hand you do have someone who thinks he’s rescuing them and saving them from these awful situations. And it’s something that we can all agree needs to happen; these kids can’t be in these situations. What were you excited to explore between Vic and her parents who each want different things for her? Tell us about the makeup. Zachary Quinto: “I’m not wearing any makeup. [Laughter] Yeah, the makeup was really important. I had been interested in the idea of really being able to disappear into a character and transform myself in significant ways. So that was one of the things that drew me to this role and to this project. And it was really important that we found truly the best people for the job. I had worked with Joel Harlow before and so when I signed onto the project and I was meeting with Jami and Kari, I said, ‘I really feel like we’ve got to try to get Joel. I know it’s a tall order,’ but luckily he was available and interested and came on board and was such an amazing ally and collaborator for all of us. We really worked on what’s important about the look of this guy and how do we represent and honor the character that Joe wrote and bring him to life in a cinematic visual way. And Joel did an amazing job, did amazing renderings and sculptures and built the prosthetics from that. One of the other things we all did was identify the stages of Manx’s aging process. So we came up with five looks that then we assigned throughout the season based on where he was in his story. So it became a bit of a formula for us to understand exactly what look it was, and then I was able to go off and develop physicality and vocal choices for each one of the phases so that when I showed up to work every day, we knew exactly what we were doing and I knew exactly which version of the character I had to step into that day. So, it was a unique process. It involved a lot of planning and a lot of everybody getting on the same page, but once we got into production, I had sometimes four and a half hours to sit in the makeup chair and think about what I was doing that day and that was good. It was cool. It’s interesting to have that be a part of my job, to show up four and a half hours before everybody else. It really does put me in a specific mindset for the day which is nice, to get to adopt and drop into that version of the character and apply him, layer by layer. Do we see stage 5 in the pilot? Did you base Charlie on an actual person? Zachary Quinto: “Well, it was all really based on the source material. As Ashleigh said, we were really lucky to have this book. One of the best things about this show was that all the scripts were pretty well written before we started shooting, so we knew where we were going and we were able to have conversations with Jami about the journeys of our characters throughout the season. That’s a real gift. When you’re doing a television show, any time you have the opportunity to work on something that’s already written is such a blessing because otherwise you’re figuring things out as you go and things can change and then you can fall behind. It can be a real challenge. Talk about Bing’s journey becoming Manx’s familiar. Ólafur Darri Ólafsson: “What I loved about what Jami did was that I think Jami really helped with Bing’s journey. She really did. By making Bing, by giving him access to Ashleigh’s character Vic, it sort of brings him much more into the story so it becomes much harder for us to see him slowly being dragged over to Charlie Manx and over to his cause. Charlie really does everything he can to make sure that Bing believes in the cause. Like you said before, at the heart of it, Charlie Manx says that he’s trying to save children from bad parents. I think most of us could agree we would all be willing to take part in that but not in the way he would. So I think what attracted me to the story was when I read the book, I remember I really enjoyed Bing’s character but when I got the scripts, I was really thankful for that, that I could really connect with him on an even deeper level, I think, through the scripts. It’s hard to, as you were talking about, play somebody who is basically a monster in many ways. We, as actors, don’t really get to, I don’t at least, I don’t feel I have the right to judge anyone so I have to approach any character through a way of trying to understand even when that’s really hard to do. And sort of try and dislocate myself and my own person and my own opinions from that of the characters. Ashleigh Cummings: “Can I quickly add that I was really interested in how you were going to play Bing and so on. I think what you did with the character, what existed in the book and what Jami brought to the script kind of epitomizes what we’ve been talking about in terms of this loss of innocence, the wounded child and how that manifests if the trauma isn’t dealt with. It really is quite – you can really see it in Bing’s character because you have this grown man who has this innocence and this childlike presence. Everyone has a gift and a shadow. It’s how those things are either nurtured and what you choose to engage and how you choose to wield those aspects of yourself. But in the case of children, a lot of that is taken out of their control. Were you allowed to bring any of yourselves into your characters? Zachary Quinto: “I would do that also with the kids because it was interesting to work with kids as much as I did on the show. To change it up for them a little bit and make it maybe a little scarier sometimes. They were such pros. They were impressive, Darby and Asher, all the kids on the show were.